Limb and joint defects may be caused by genetic abnormalities, growth restriction in the womb, or mechanical forces. The diagnosis is based on a physical examination, x-rays, and sometimes ultrasonography. Usually, surgery is needed to correct the defect. Limbs or joints can be missing, deformed, or incompletely developed at birth. A child with one limb or joint abnormality is more likely to have another related abnormality. 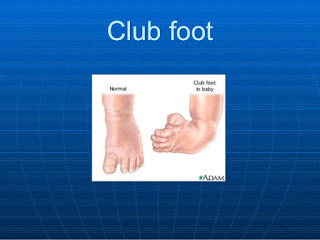 Limbs and joints may form abnormally. For example, bones in the hand and forearm may be missing because of a genetic defect. Normal development of a limb can also become disrupted in the womb. For example, a finger may stop growing because the finger gets constricted by fibers. Another cause of limb and joint abnormalities is mechanical force. For example, pressure may cause the hip to dislocate. Chromosomal abnormalities can cause limb and joint abnormalities. Sometimes the cause is unknown. The drug thalidomide, which was taken by some pregnant women in the late 1950s and early 1960s for morning sickness, caused a variety of limb defects—usually short, poorly functioning appendages developed in place of arms and legs. Abnormalities of the arms and legs may occur in a horizontal fashion (for example, if the arm is shorter than normal) or in a lengthwise fashion (for example, the arm is abnormal on the thumb side [from the elbow to the thumb] but normal on the little finger side). Children often become very adept at using a malformed limb, and an artificial limb (prosthesis) can often be fitted (usually when the child is able to sit independently) to make the limb easier to use. Hand defects are common. Sometimes a hand does not form completely, and part or all of the hand may be missing. For example, the person may have too few fingers. Sometimes a hand does not develop. For example, the fingers may not separate, producing a weblike hand. Some hand defects involve extra fingers. The little fingers or thumbs are most commonly duplicated. Overgrowth may occur, in which the hands or individual fingers are too large. Surgery is usually done to correct the hand defect and provide as much function as possible. In developmental dysplasia of the hip, formerly called congenital dislocation of the hip, the newborn's hip socket and the thighbone (femoral head), which normally form a joint, become separated, often because the hip has a socket that is not deep enough to hold the head of the femur. Dysplasia of the hip is more common among girls, among newborns born in a breech (buttocks-first) position, and among newborns who have close relatives with the defect. Newborn girls born in breech position should have ultrasonography of their hips. The right and left legs or hips often look different from each other in affected newborns. The doctor may be able to detect the defect when examining the newborn. In infants younger than 4 months, ultrasonography of the hips can confirm the diagnosis. In infants older than 4 months, an x-ray can be used. The use of triple diapers (an older treatment) is not recommended. The best treatment is early use of the Pavlik harness. The Pavlik harness is a soft brace that holds the infant's knees spread outward and up toward the chest. However, if the defect persists past the age of 6 months, surgery to fix the hip in the normal position is usually needed.